Living History is the autobiography of Secretary of State, former United States Senator from New York, and former First Lady Hillary Rodham Clinton, published in 2003. In December 2000, Simon &amp; Schuster agreed to pay Clinton a reported $8 million advance for what became Living History — a near-record figure to an author for an advance at that time. Critics charged that the book deal, coming soon after her election to the U.S.
Boston: Simon & Schuster. 2003. First Edition; First Printing. Hardcover. 0743222245 . A Mint copy in a Mint slipcase. ; Limited Edition of 1500 Copies - Signed by Hillary Clinton. ; 1.1 x 9.2 x 6.1 Inches; 562 pages; Signed by Author . Simon & Schuster, 2003. Book. Fine. Hardcover. Presentation By Author. Limited Edition. 8vo - over 7¾ - 9¾" tall. Limited Edition.1/100 For Presentation #57. "To Ermalind Guerin with thanks and best wishes Hillary Rodham Clinton." Mint Copy in Matching Slipcase. Incredibly Scarce Edition..
New York: Simon & Schuster,, 2003. Octavo. Original dark blue boards, gilt lettering and rule to spine, blue speckled edges. With the dark blue slipcase. 16 photographic leaves. A fine copy. Signed limited edition, number 1,161 of 1,500 specially-bound first printing copies signed by the author. New York: Simon & Schuster, (2003). First Edition. Hardcover. Fine in slipcase without dustwrapper, as issued. First Printing, Limited Edition. Illustrated with photographs. One of 1500 numbered copies SIGNED in full by the author, the former First Lady, New York Senator, Presidential candidate, and current Secretary of State. A large but undetermined number of copies of this title were apparently bound without the signed page making this a book one should not purchase still sealed in the shrinkwrap. This copy still retains the original shrinkwrap but the book has been removed to verify that the signed page is present. NY: Simon & Schuster, 2003. First edition, limited issued of 1500 numbered copies signed by Clinton on the limitation page. Copy #61/1500. Author's Note. Index. Black and white photographs. Issued without dustjacket. Slipcase. Unread copy in Fine condition in a Fine slipcase isbn sticker as issued.. Signed by Author. First Edition. Hardcovers. 8vo - over 7¾" - 9¾" tall. Limited Edition. The images are of the book described and not stock photos. New York, New York: Simon & Schuster, 2003. Fine. DJ in plastic cover. Signed by Hillary Clinton (without personalization) on the title page. Illus. with B&W photos. Incl. Acknowledgments, Key to Photographs, and Index. (xi) 562 pp. Incl. ephemera: ticket for the signing event for this book.. Signed by Author. First Edition, 1st Printing. Hard Cover. As New/As New. New York: Simon & Schuster. Very Good with no dust jacket. 2003. Special Edition. Hardcover. Navy blue buckram boards with gilt text on spine and blue speckled edges. Navy blue slipcase with author's name blind embossed on front. Signed by Hillary Rodham Clinton. Copy number 1085 out of only 1500 copies printed for sale in the U. S. A. & 100 for presentation. The lightest of shelf wear to slipcase; still in very good condition. Extremely light soiling to boards. Text block is immaculately clean. Binding is tight and square. Former First Lady Hillary Rodham Clinton's autobiography from the year 2003, before she assumed office as Secretary of State. Features chapters on topics such as her time spent at Yale University, giving birth to her daughter, Chelsea, and Former President Bill Clinton's impeachment. Includes a variety of black and white photographs of important moments in Clinton's life. ; B&W Photographs; Large 8vo 9" - 10" tall; 562 pp; Signed by Author . NY: Simon & Schuster, 2003. First edition, limited issued of 1500 numbered copies signed by Clinton on the limitation page. Copy #1210/1500. Author's Note. Index. Black and white photographs. Issued without dustjacket. Slipcase. Unread copy in Fine condition in a Fine slipcase in the publisher's original shrinkwrap (which has been opened) with isbn sticker as issued.. Signed by Author. First Edition. Hardcovers. 8vo - over 7¾" - 9¾" tall. Limited Edition. The images are of the book described and not stock photos. New York: Simon & Schuster. As New. 2003. Limited/Numbered Edition; Signed by Author. Hardcover. 0743257723 . Limited edition of 1,500 copies, individually numbered in matching full-cloth slip case, marbled endpapers, and speckled top-stain. As New condition, never taken out of its original shrink-wrap, SIGNED by the author, former first Lady, New York Senator, Presidential Candidate and Secretary of State Hillary Rodham Clinton directly on the limitation page; Former First Lady, presidential candidate and US Secretary of State Hillary Rodham Clinton is known to hundreds of millions of people around the world. Yet few beyond her close friends and family have ever heard her account of her extraordinary journey. She writes with candor, humor and passion about her upbringing in suburban, middle-class America in the 1950s and her transformation from Goldwater Girl to student activist to controversial First Lady. Living History is her revealing memoir of life through the White House years. It is also her chronicle of living history with Bill Clinton, a thirty-year adventure in love and politics that survives personal betrayal, relentless partisan investigations and constant public scrutiny . New York, NY: Simon and Schuster, 2003. [American politics] SIGNED FIRST EDITION. Octavo (24 x 16cm), pp.xi; ; 562. Publisher's black quarter cloth over black paper covered boards, gilt titles to spine, dust-jacket designed by Jackie Seow, with printed price of U.S. $20.00 | Can $44.00. With two suites of photographic plates. Signed by the Hillary Clinton to the first blank. With an unused birthday card featuring Hillary Clinton loosely inserted. One of the plates has a crease from folding with an image of Bill Clinton circled in red marker pen, one page with a passage highlighted in yellow, the page corner folded over, some marks to edges. Binding and wrapper lightly creased and rubbed to top and bottom edges. Very good. NY: Simon & Schuster, 2003. First edition, first prnt. Limited issue of 1500 numbered copies signed by Clinton on the limitation page as issued. Copy #1474. Issued without dustjacket. Slipcase. 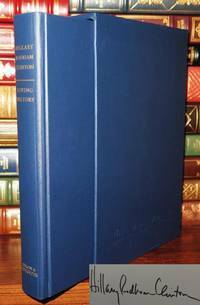 Slipcase with small, shallow edge compression; otherwise, an unread copy in Fine condition in a Fine slipcase.. Signed by Author. First Edition. Hardcovers. 8vo - over 7¾" - 9¾" tall. Limited Edition. The images are of the book described and not stock photos. New York: Simon & Schuster, 2003. Hardcover. Fine/Fine. First edition. Slight foxing on one leaf, else fine in a fine dustwrapper. Inscribed by the author to Bill Boggs, four-time Emmy Award-winning television talk show host and raconteur, who interviewed Clinton on his show: "Bill - Best wishes! Hillary Rodham Clinton." Shi Bao Wen Hua, 2003-06-01. Chinese. Paperback. Used:Good. NY: Simon & Schuster, 2003. First edition, first prnt. Author's Note. Index. Black and white photographs. Signed by Clinton on the title page. Unread copy in Fine condition in a Fine dustjacket with an archival cover.. Signed by Author. First Edition. Hard Cover. 8vo - over 7¾" - 9¾" tall. The images are of the book described and not stock photos. New York: Simon & Schuster. Hardcover. 0743222245 This is an excellent copy of the first printing of Clinton's excellent memoir from 2003. The book and dust-jacket are clean tight and square though the top corners are slightly bumped. This copy has been boldly signed on the second blank page by the author. Ships immediately from Oregon fully insured in a well padded box. . Fine. 2003. 1st Edition. Simon & Schuster, 2003. First Edition. Hardcover. Like New/Like New. Signed by Author. New York: Simon & Schuster, 2003. First edition, first printing. Hardcover. 562 pp. Fine, in a fine unclipped jacket. Signed by author, Hillary Rodham Clinton, on the title page. New York: Simon & Schuster. 2003. First Edition; First Printing. Hardcover. 0743222245 . Very Good in a Very Good dust jacket. A read copy. ; Signed by Hillary Clinton on the title page. ; 9.20 X 6.10 X 1.10 inches; 576 pages; Original unclipped dust jacket protected by archival Brodart cover. All domestic orders shipped protected in a Box. ; Signed by Author . 2003-03-05. New. Ships with Tracking Number! INTERNATIONAL WORLDWIDE Shipping available. Buy with confidence, excellent customer service! New York: Simon & Schuster, 2003. Hardcover. Very Good. First Edition, Seventh Printing. Signed by Hillary Clinton on the title page in black marker. In Near Fine condition. Clean text, with a few small corner creases to pages. Gift inscription to previous owner on front free end paper. Light rubbing and light wear to boards. The dust jacket shows light rubbing and light edge wear. A nice copy overall; Rare signed. New: Simon & Schuster, 2003 Signed and inscribed boldly in black marker on the title page, Hillary signs in full. Protected in mylar, great condition. Later printing.. Signed by Author. Later Printing. Hard Cover. Fine/Fine. 8vo - over 7¾" - 9¾" tall. New York: Simon & Schuster, 2003. 1st Edition. Hard Cover. BOOK FINE/DUSTJACKET FINE. 8vo - over 7¾"" - 9¾"" tall. Signed by Author. FLAT-SIGNED BY THE AUTHOR ON THE TITLE PAGE. BOLDY SIGNED IN PERSON FOR US IN BLACK SHARPIE PEN, ""HILLARY RODHAM CLINTON."" AN EXTREMELY CLEAN, ATTRACTIVE COPY WITH A BRIGHT, BEAUTIFUL DUSTJACKET IN NEW, GLOSSY BRODART. 1ST PRINTING. NOT PRICE CLIPPED. NO PREVIOUS OWNER MARKINGS. NOT a remainder. GIFT GIVING CONDITION. New York: Simon & Schuster, (2003). First edition. Her memoirs of her time as first lady. SIGNED on the title page. Spine ends just gently nudged still fine in fine dust jacket with barest wear. Simon & Schuster, 2003. Book. As New. Hardcover. Signed by Author(s). Limited/Numbered. Edition limited to 1,500 numbered copies. In a fine slipcase. .
NY: Simon & Schuster, 2003. First edition, first prnt. Signed by Clinton on the title page. Books & Books, Inc. "Autographed" sticker on front panel of dustjacket. Unread copy in Fine condition in a Fine dustjacket with an archival cover.. Signed by Author. First Edition. Hardcovers. 8vo - over 7¾" - 9¾" tall. The images are of the book described and not stock photos. Scribner, 2004. First THUS. Paperback. Very Good. Signed by Author. New York: Scribner, 2004. First Scribner paperback. 567 pp. Very good, with a touch of wear to the extremities and a very slight crease at the back cover. Hand inscribed by Hillary Clinton to former Chicago Alderman, Bernard Stone, on the title page. New York: Simon & Schuster, 2003. First Edition, First Printing. Hardcover. Octavo., xi, 562 pages; VG/VG; spine red with gilt lettering; dust jacket protected with a mylar covering, price uncut '$28.00'; very minor bumping to corners, head and tail of spine; sticker next to head of spine on front cover; full number line on copyright page; SIGNED by Hillary Clinton on title page, flat signature; interior clean; binding tight; BL consignment; shelved case 5. Shelved Dupont Bookstore. Simon and Schuster, 2003. Book. Fine. Hardcover. Presentation By Author. 1st Edition. 8vo - over 7¾ - 9¾" tall. Fine copy In Like Jacket First Edition/First Printing Without Wear$28.00 On Flap Signed In Year of Publication. " Aileen Thanks for a great year! Hillary 2003" On Title-Page Gorgeous Fresh Copy..
Simon & Schuster. Collectible - Very Good. Condition: Very Good; Dust Jacket : Very Good+. 1st Printing. Signed by Author. Left hand corner of back cover has been nicked and corner of paper has been torn (very small). U.S.A.: Simon & Schuster, 2003 A fine first edition in a fine dust jacket, signed by Hillary Clinton on the title page. Complete row of numbers from 10 to 1 on the copyright page.. Signed by Author(s). 1st Edition. Hardcover. Fine/Fine. New York: Simon and Schuster, 2003. First edition of the former First Lady's autobiography. Octavo, original black boards, illustrated. Signed by Hillary Rodham Clinton on the title page. Fine in a fine dust jacket. Here is the biography from of the First Lady who traveled tirelessly around the country to champion health care, expand economic and educational opportunity and promote the needs of children and families and women's rights. Intimate and inspiring, Living History epitomizes the challenging process by which one of the most impressive figures of our generation came to find her voice as a woman and as a formidable figure in American politics. New York: Simon & Schuster. Very Good+ in Very Good+ dust jacket. 2003. First Edition. Hardcover. 0743222245 . Sticker residue to Brodart covering; SIGNED by author to bookplate tipped in to front free endpaper ; B&W Photographs; 8vo; 562 pages . U.S.A.: Simon & Schuster, 2003. 1st Edition . Hardcover. As New/Fine. Signed and inscribed by author. VERY minor edging on dust jacket from shelf wear. Simon & Schuster, 2003. First. Hardcover. Fine - Collectible/Very Good. Author signed first edition first print book is as new looks unread, jacket has very light shelfwear to top edge particularly the two upper points. ferg Please email for photos. New York: Simon & Schuster, 2003. Seventh Printing. Hardcover. Very Good/very good. Black hardcover, 7th printing in dustjacket, with "Woman Card" laid in at front. Signed without inscription by twice presidential candidate Hillary Rodham Clinton on the title page without inscription. A very good copy with light bending at the heel of the spine and minor shelf-wear. Binding and hinges are solid and the text is clean and tight. Unclipped dustjacket is bright and attractive, but with minor crinkling at the top edges and light bumping to the upper corners. Laid in at front is a pink "Woman Card" - a tool in Clinton's second presidential campaign. 562 pp., indexed, many photos in 2 inserts. Clinton will remain an undeniable ground breaker in American history in spite of 2 failed presidential bids. 2003-05-01. New. Ships with Tracking Number! INTERNATIONAL WORLDWIDE Shipping available. Buy with confidence, excellent customer service! New York: SIMON & SCHUSTER, 2003. A FINE FIRST EDITION IN DJ. SIGNED BY AUTHOR. on title page. HARDCOVER. Signed. FIRST EDITION.. Hardcover. Fine/Fine. New York: Simon & Schuster, 2003 First edition boldly signed by the author on second blank prelim with black marker: "Hillary Rodham Clinton". 8vo. Black boards blindtamped on front cover and stamped in gilt on spine. xi, 562 pages. Two sections of B&W photos printed on slick paper. Previous owner's name and address on front pastedown under jacket flap otherwise clean. Tightly bound. No signs of wear. Dust jacket. Fine/Like new. .
New York: Simon & Schuster, 2003 First edition signed by the author on title page with black marker: Not inscribed. Oval autographed copy sticker on front panel of dust jacket. 8vo. Black boards stamped in gilt on spine. xi, 562 pages. Two sections of B&W photos printed on slick paper. Dust jacket not price clipped. Like new/Like new. .
New York: Simon & Schuster, 2003 First edition signed by the author on title page with blue marker: "Hillary Rodham Clinton". 8vo. Black boards stamped in gilt on spine. xi, 562 pages. Two sections of B&W photos printed on slick paper. Dust jacket. Like new/Like new. .
New York: Simon & Schuster, 2003. First Edition/first printing.. Hardcover. New/new. ISBN:0743222245. [4to] 562p. index. New in dj protected against wear and tear in Brodart Archival Mylar. NY: SIMON & SCHUSTER, 2003. FLAT SIGNED TO TITLE PAGE.. Signed By Author. FIRST EDITION. HARDCOVER. FINE/Fine. Shi Bao Wen Hua, 2003-06. Paperback. Good. New York: Simon & Schuster, 2003 First edition signed by the author on flyleaf with blue marker: "To John Hardbulak, With your continued support I feel confident that I will "lick" all the competition. Happy Birthday! Love, Hillary Rodham Clinton". (Fills entire flyleaf). 8vo. Black boards stamped in gilt on spine. xi, 562 pages. Dust jacket. Like new/Like new. .
NY: SIMON & SCHUSTER, 2003. INSCRIBED & SIGNED BY AUTHOR TO TITLE PAGE: "FOR CHARLES AND NINEL-BEST WISHES.". INSCRIBED & SIGNED BY AUTHOR. 7TH. HARDCOVER. FINE/Fine. New York: Simon & Schuster. 2003. First Edition; First Printing. Hardcover. 0743222245 . Very Good+ in a Very Good+ dust jacket. ; 9.20 X 6.10 X 1.10 inches; 576 pages; Original unclipped dust jacket protected by archival Brodart cover. All domestic orders shipped protected in a Box. .